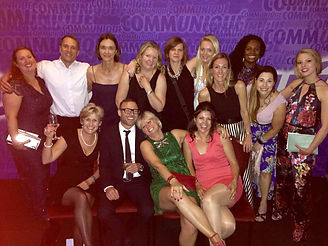 Lucid Group’s commitment to be a leader in medical education was recognised at the Communiqué Awards 2016 in London last night, where the agency received three awards, including being highly commended in the ‘Communications Consultancy of the Year’ category. Lucid was shortlisted as a finalist in all six of the categories that it entered this year: three programme, two individual and a company category. It heard last night that it had won the ‘Excellence in Communication of Survey or Market Research Data’ category, and that Louise Verrall (Business Unit Director) had won ‘Emerging Leader in Healthcare Communications’. Lucid entered the ‘Communications Consultancy of the Year’ category for the first time this year and is pleased to have been highly commended. “Lucid is evolving and maturing, and 2015 was our best year yet. Excellent partnerships helped us achieve industry-leading financial growth. This allowed us to invest in the future of our organisation to achieve our vision to change patients’ lives,” commented Dennis O’Brien (Lucid Co-founder and CEO). Lucid also sponsored the Medical Education Consultancy of the Year award this year – a category that the group won for a record-breaking 3 consecutive years from 2013 to 2015. “We want to contribute to raising the quality of healthcare in many different ways, and supporting initiatives like Communiqué helps to encourage forward-thinking medical education,” Jan Steele explained.